When now-deceased American student Otto Warmbier was first arrested and sentenced to 15 years of hard labor in prison in North Korea simply for taking down a poster, the response from some on the left was to mock him. "North Korea Proves Your White Male Privilege Is Not Universal," read one Huffington Post piece, penned by blogger La Sha, days after Warmbier was sentenced in March 2016. Warmbier, she wrote, "learned that the shield his cis white male identity provides here in America is not teflon abroad." 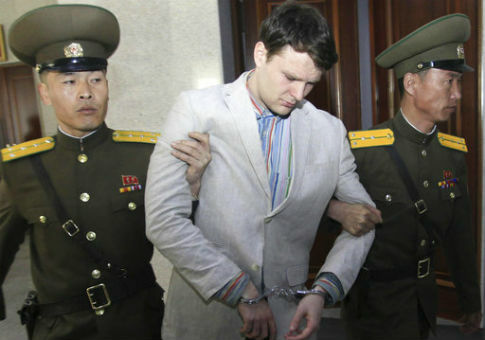 "As shocked as I am by the sentence handed down to Warmbier, I am even more shocked that a grown man, an American citizen, would not only voluntarily enter North Korea but also commit what's been described a ‘college-style prank,'" she continued. "That kind of reckless gall is an unfortunate side effect of being socialized first as a white boy, and then as a white man in this country." La Sha's piece was also tweeted out by EBONY magazine. Salon was, if anything, giddier. "This might be America's biggest idiot frat boy: Meet the UVa student who thought he could pull a prank in North Korea," read the site's headline. Most of that piece was spent praising a segment from Comedy Central's "The Nightly Show With Larry Wilmore," in which Wilmore also mocked Warmbier. "It's just tough for me to have much sympathy for this guy and his crocodile tears," Wilmore said. "If your hazing includes international crimes, you've got to read the fine print on your American frat bro warranty … it says, ‘Frat Bro Privilege not valid in totalitarian dystopias,'" he joked. Warmbier was later released to his family in a comatose state after 17 months in a North Korean prison. He passed away Monday, with the family blaming abuse he sustained at the hands of the communist government. This entry was posted in National Security and tagged Media, North Korea, Otto Warmbier. Bookmark the permalink.